Were you or your family employed in the mills ? Our next talk is this Sunday, 28th February when Gordon MacDonald is coming to speak to us. The title of his talk is ‘From Tweeds to Twin-Setts'. The talk takes place at the Corn Exchange and Ormiston Institute, Market Square, Melrose, TD6 9PN. Map. 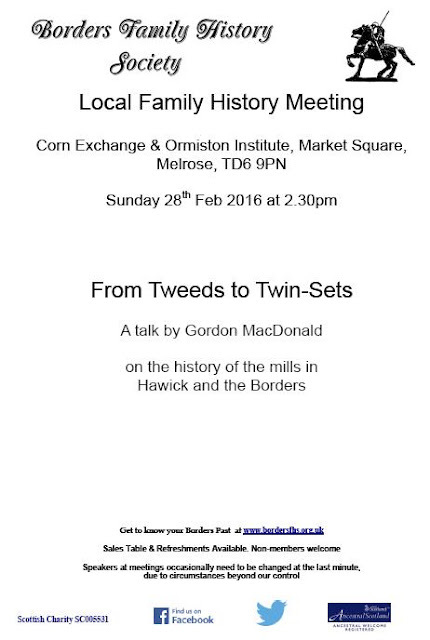 Gordon’s talk will be about the history of the mills in Hawick and the Scottish Borders. I warmly invite you to attend the talk whether you are a member or not. Doors open at 2pm; the talk begins at 2.30pm. I find the history of the mills especially fascinating because although no members of my family worked in the Borders mills, some of them migrated from Dumfriesshire to north-west England to get better-paid work in the mills, there. I suggest you come early to get a good seat. and To Follow the Dogs and Carry the Stick by Bob Jaffray about shepherds in the Lammermuirs.